1. Bring quarts of salted water to a boil, and cook the pasta until it's al dente'. Drain, then pace back into the hot pot to remove the residual moisture. Add the oil, and make sure that all of the pasta is coated. The oil will keep the pasta from sticking together. 2. Peel and devein the shrimp, then coat with the blacken and salt. 3. Cook the shrimp in a Teflon fry pan with about 2 tablespoons of oil. Cook on each side about 2 minutes. Add additional oil as needed. Set these aside while you make the sauce. When about 1/2" of the tail has turned pink, it's time to flip them over to the other side. Don't overcook shrimp, they become tough and chewy..
Mince the onions real fine, and cook them in a pot along with the oil and butter, over medium heat. Don't have the heat so high that you brown them. Cook until the onions are translucent. 5. Add the flour, and stir it in, making a Roux. Continue to cook the roux over medium heat, stirring often, for about 5 minutes. Add The Wine, turn the heat to medium high,and stir it into the roux until it's all blended, then add the buttermilk, parsley, and white pepper. Let this all get hot, remove it from the heat, and add the blue cheese. Keep stirring until the blue cheese has melted. Now's a good time to taste for salt and pepper. Blue Cheese is inherently salty, so be careful about adding more. 6. All of the above can be done up to an hour or so prior to your wanting to serve. When it's time to eat, Place the pot of pasta, back on the stove over medium heat. Stir in the shrimp, and let it heat up, stirring often, about 5 minutes. 7. Add the sauce, and continue re-heating over medium heat, being sure to keep an eye on it and stir often from the bottom to the top. It'll burn pretty quickly. 8. To plate, place a pile of the Alfredo on a plate. 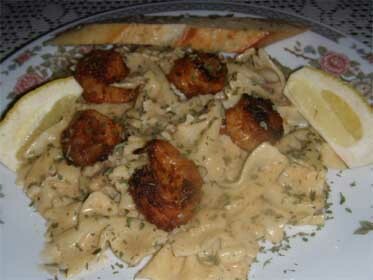 I saved some of the blackened shrimp as a garnish, sprinkle with minced parsley, and provide a lemon wedge.